To have past Programming Olympiad finalists as members of teams in the Standard Bank IT Challenge for Universities is quite usual. Often these teams end up making it to the Finals and even winning the Finals. However, this is the first time that a winning team has been made up entirely of past Olympiad finalists. ROBERT SPENCER was only in grade 9 in 2009 when he made it into the Programming Olympiad Finals the first time. He went on to win Bronze in 2010 and 2011 and Gold in 2012. Robert was part of the South African team at the International Olympiad in Informatics in 2012 and 2013 – winning Bronze in 2013. ROBIN VISSER was in grade 11 when he won Bronze in 2013. He did even better in 2014, winning Silver. At the International Olympiad in 2015 he won Bronze. TAE JUN PARK is a relative youngster – winning Bronze in the 2015 Programming Olympiad. Their team, named BetaGo, broke all past records by solving six tasks in an unbelievable two-and-a-half hours. They were the only team of the 94 teams participating that managed to solve all six tasks. 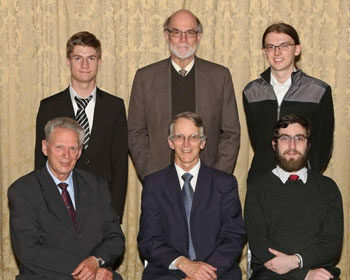 Among the other UCT teams were more past Olympiad finalists: Jonathan Alp (2013), Reuben Steenekamp (2012) and Robert Wood (2015). Pretoria teams included Grant Zietsman (2012), Renette Ros (2012) and Ulrik de Muelenaere (2013-15). Stellenbosch fielded Dylan Nelson (2011).